Sulphur is effective in treating sarcoptic mange in dogs (also known as canine scabies), a disease which is caused by the mite known as Sarcoptes scabiei. Sulphur works in treating sarcoptic mange by disrupting the cellular proteins produced by the mites, causing their death. However it is considered ineffective in treating demodectic mange, a disease caused by another type of mite. Sulphur also has antibacterial and antifungal properties. Lime-sulphur dips are the most common treatment used to treat canine scabies. These dips contain a concentrated form of sulphur. Sulphur is also an active ingredient in some shampoos. These shampoos may be helpful in treating bacterial skin infections; however the lime sulphur dip is generally used to treat sarcoptic mange. Put on water-proof gloves. Mix 4 oz. lime sulphur with a gallon of warm water in the mixing container. It is important to add the lime sulphur to the mixing container first, then add the warm water. Pour the diluted dip into a spray bottle and recap the nozzle. Set aside. Remove gloves and wash your hands. Apply some petroleum jelly or mineral oil around the eyes to protect your dog's eyes from the suphur dip. In addition, put a drop of mineral oil in each eye to protect against irritation. 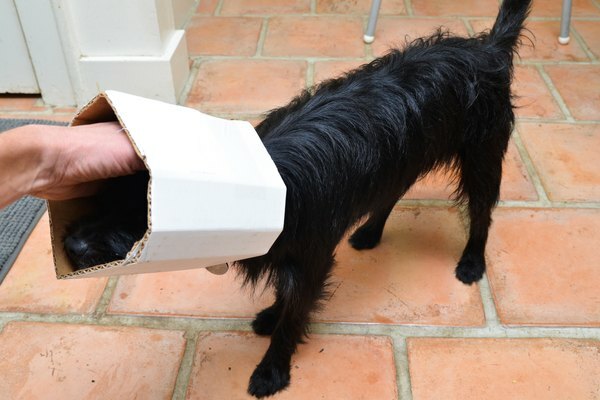 Place your dog in a laundry sink with a drain or tub. 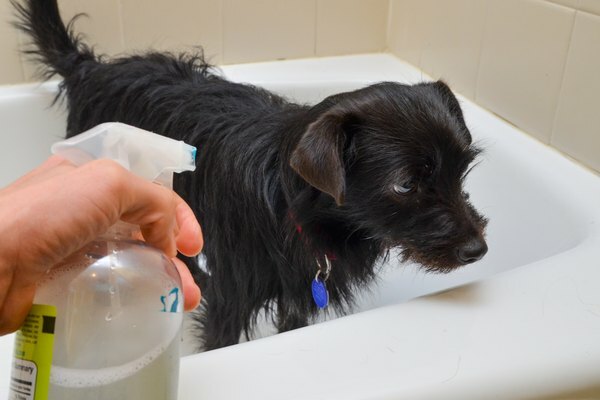 Bathe your dog using a mild cleansing shampoo. Replace gloves to avoid skin contact. Saturate the entire coat from the neck to the tip of the tail. Place the spray bottle close to the skin and soak the dog to the skin. Soak a sponge in the diluted lime sulphur solution and pat carefully around the face and ears. Be careful not to allow any of the solution to get into the eyes. Place an Elizabethan collar, a truncated cone that prevents a dog from licking its coat, until the lime sulphur solution has dried. Allow the solution to dry without intervention. Do not use a towel to dry the dog. Do not attempt to speed up the drying time. Repeat every five to seven days for a period of six weeks. Always wear gloves when handling lime sulphur, especially in the concentrated form. Do not use the lime sulphur dip on your dog without diluting it. It may be toxic in its concentrated form. Remove all jewelry prior to using sulphur. Sulphur may change the color of some jewelry. It may also discolor porous surfaces and temporarily stain the hair coat of light colored pets. Sulphur smells strongly and should be used only in well-ventilated areas. Rinse work area well with soapy water.